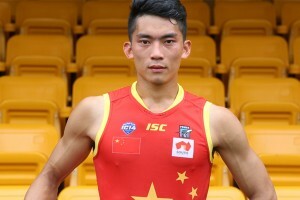 No one will be wanting to pull on the Team China guernsey more than Chen Shaoliang this weekend. 1. Will Chen suit up? Since winning the 2015-16 SCAFL and GDAFL Goal kickers award, lovers of Asian footy haven’t seen Port recruit Chen Shaoliang in Action. In fact no one has. A devastating ACL in just his second training session after moving to Adelaide last year has had him stuck on the sidelines, relegated to long rehab sessions and photo opportunities with world leaders. After moving well at Shanghai Tigers training on Wednesday night rumours of a comeback game in his national colours is rife but there is little doubt Port medicos won’t be risking bringing back their star recruit too early if he is not 100% fit after such a long lay-off. But wow, wouldn’t it be great to see the big athletic forward kicking goals for his old Guangzhou Scorpions team on Saturday or Team China on the biggest stage of his life at Jiangwan Stadium Sunday afternoon! 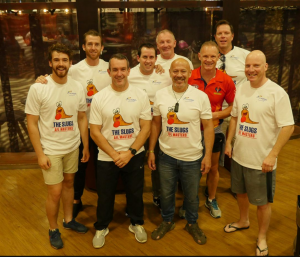 Ever since Greg Stafford and Nick Daffy dominated the 2006 Asian Championships in Thailand with the China Reds, the issue of ‘ring ins’ has dominated discussions at the annual Asian Champs President’s meeting. While the Champs now enforces strict rules around player eligibility, there is no such shame in Shanghai with all teams able to bring into their team any players they like. While the big clubs of Singapore and HK have traditionally dominated Asian champs, there is no doubt the abolition of ring in rules and a cap of 20 per side will significantly even the playing field. Expect up and coming clubs like Malaysian Warriors, Vietnam Swans and Lao Elephants to feature strongly in the finals if they can land a fit oil rigger with dreadlocks that can run all day or two. Likewise in the Masters Division where we welcome whole teams of Australian-based ‘ring ins’ in the form of The Slugs from Adelaide and the Coral Coast Sons from Kalbarri, WA, both who are rumored to be bringing over plenty of wiley old talent which should add much to the colour and spectacle of the day. 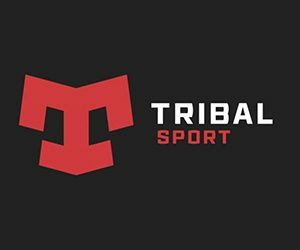 While we are all aware of the great work Port Adelaide is doing in developing footy in southern China, don’t sleep on local players from many of AFL Asia’s other clubs that are heavily investing their own money and resources into developing locals in their part of the world, without the backing of an AFL club. 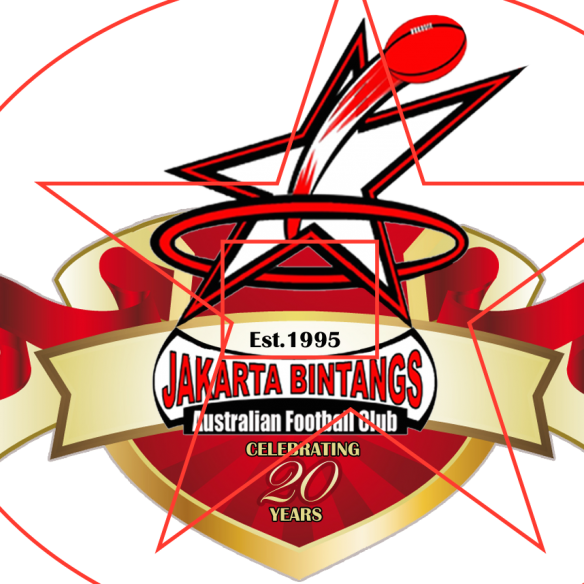 No more so is this evident than in Indonesia where the Jakarta Bintangs and Borneo Bears have over the past 5 years developed a leading local player development program with the support of the Australian Embassy in Jakarta. 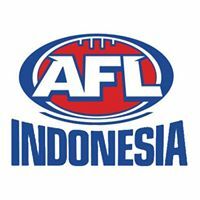 Footy is now booming in Indonesia and the six Indonesian locals selected to represent the Barbarians in the Shanghai Cup on Saturday and the Asian Lions on Sunday will be key players to watch out for. Also keep an eye out for the toughness of the veteran Lao Elephant local players, some of the most experienced and hard locals in Asian footy, the Cambodian Eagles’ ‘mosquito fleet’ led by exciting winger Nas, the experienced and skilled Japanese Samurai players and the courage of the hard-as-nails Vietnam Swans locals. 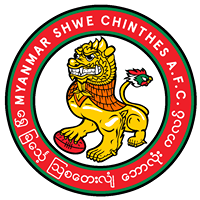 It’s still early days for the development of local footy in Asia with many of the bigger clubs still yet to fully embrace local player development. Those players travelling to Shanghai are still very much learning the game and may not yet have the cleanest skills going around, but their love and passion for footy and the role they are playing in inspiring the next generation of local footballers is without question. 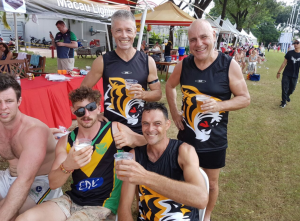 Get around all the locals playing in the Guangzhou Scorpions, Barbarians, Vietnam Swans, Lao Elephants and Japan Samurais teams on Saturday, before they all go head to head in the massive Team China vs AFL Asia Lions game on Sunday at Jiangwan Stadium. 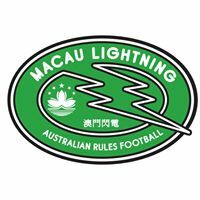 After a stellar 5-minutes with Macau Lightning in the Division 2 of the 2016 Asian Champs, kicking what many regard as the most memorable goal in the 18-year history of the AFL Asian Champs (yes, he didn’t actually play with the Vietnam Swans) and not saying no to a selfie, autograph (or beer) all day long, Western Bulldog champion Tom Liberatore will always welcome back in Asia! 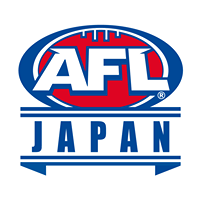 Unfortunately, the AFL earlier this week contacted AFL Asia to inform us that Libba was unavailable for Shanghai. 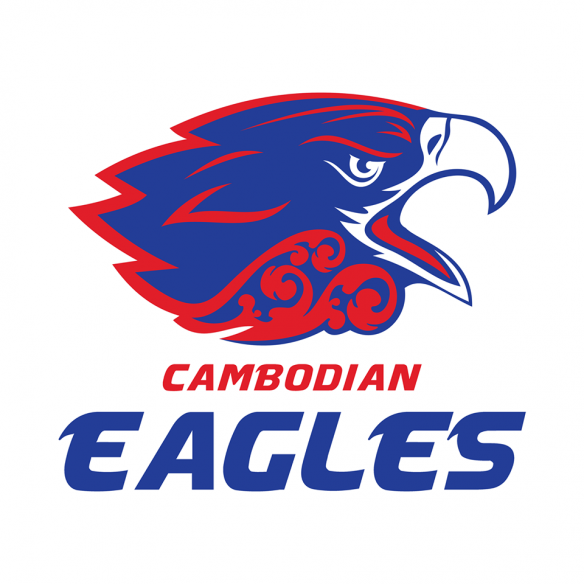 Bad news compounded by the confirmation from IndoChina Coach and Champs regular Andrew Embley that he was also out due to his Triple M commentating commitments (much to his dismay). We hope this opens the door for a whole host of ex-AFL legends to gain similar levels of celebrity status by having a run at the Shanghai Cup. With the AFL circus in town and names such as Anderson, Motlop, Wanganeen, McLachlan and Oleranshaw being thrown around, there is a good chance we might see a guest appearance or two throughout the day at the Cup. While most of Asia’s footy biggest rivals have been separated into different pools, expect plenty of passion should the Hong Kong Dragons and Singapore Wombats, the Beijing Bombers and Shanghai Tigers or the Vietnam Swans and Malaysia Warriors meet in the Semi or Grand Finals. 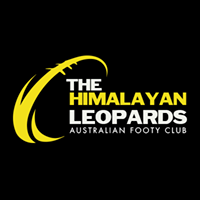 The Dragons-Wombats rivalry goes back almost 20 years with both clubs periodically laying claim to the “best team in Asia”. HK currently has bragging rights over Singapore after their 2015 Asian Championships victory, taking their ledger to 6 Champs to the Wombats 5. 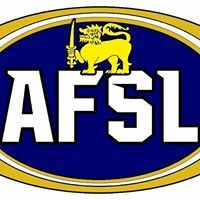 The Wombats’ traditionally don’t win too many games outside Asian Champs, going down to Thailand in their recent ANZAC Day clash, but a potential finals appearance against the Dragons should be enough to spur them out of their winter slumber. The Beijing – Shanghai rivalry also goes back over a decade, with their annual “China Cup” clash one of the feature games on the AFL Asia calendar. 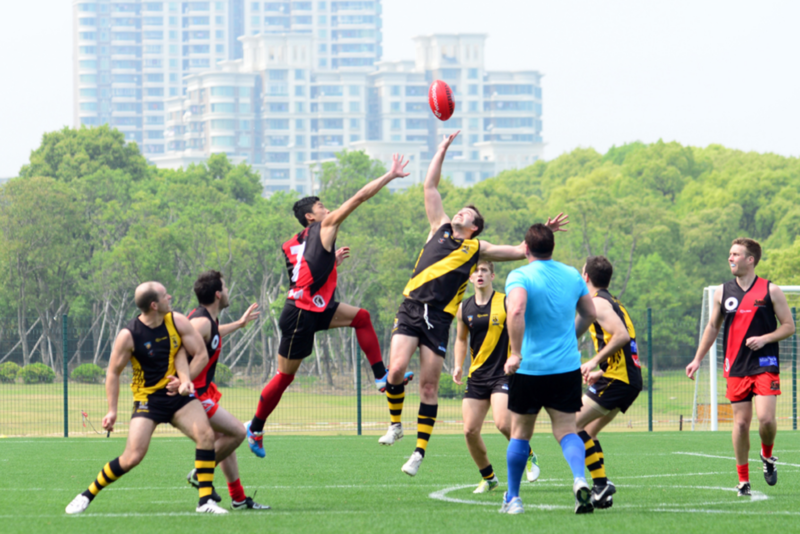 It’s been many years since the Bombers have won in Shanghai, but the rebirth of Beijing footy is well underway and we are expecting a good showing from them at the Cup. Asian Champs Div 1 rivals Vietnam-Malaysia are two teams that also meet regularly throughout the year in one-offs and tournament play, while either has yet to taste Asian Champs success they continue to improve and have challenged the big clubs well in recent years, playing in a number of finals at Champs and the Manila Cup. 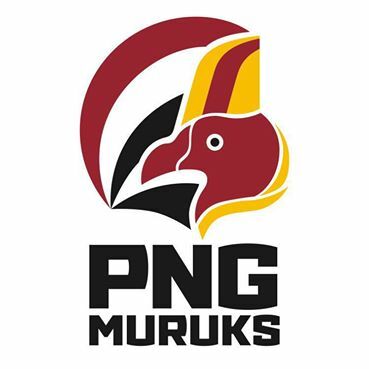 The Warriors had a shock defeat at home on Anzac Day to ladder-leading Jakarta Bintangs, the first loss in KL in many years, so will be looking to improve in Shanghai on the back of some strategic recruiting and take home their first major tournament win in this their 25th Anniversary year. The Swans will be another smokey that could surpise a few teams should some of their former best players travelling over from Australia find some space on the small grounds. 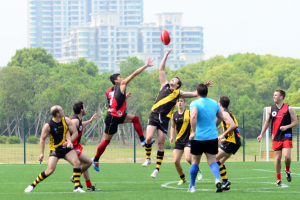 The Shanghai Cup, held in conjunction with AustCham Shanghai’s Summer BBQ, should see anything up to around 1000 additional spectators on the sidelines cheering on the action. With the many catering tents sure to tempt many of the footballers, the biggest struggle for many of the coaches will be to keep their players away from the pie and beer tents until the final game. Expect also kids play areas, live Aussie covers band and plenty of entertainment throughout the day. 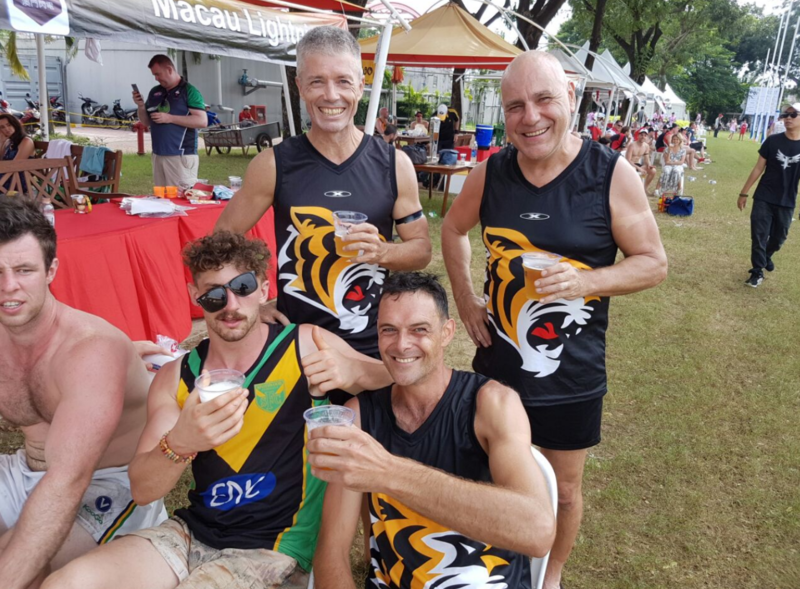 The coming together of the AFL Asia and Shanghai expat communities should provide a real carnival atmosphere to the day and another great reason to head down to Wellington College.